It may not be the closest to the Sun but Venus is the hottest planet in the solar system with an average surface temperature of 464 degrees Celsius. This temperature is due to an extreme greenhouse effect brought on by the thick carbon dioxide atmosphere. 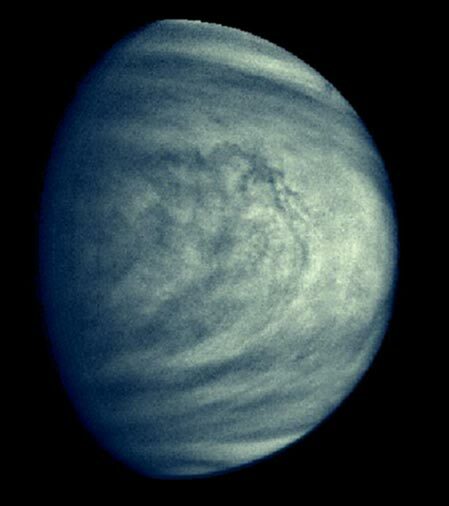 Venus is considered to be Earth's sister planet because of its closeness in size and mass to that of the Earth. Venus has the most extreme retrograde (backwards) rotation of any planet in the solar system taking just over 243 Earth days to complete one rotation with respect to the stars. The only other planet to have a retrograde rotation is Uranus. Pluto also has a retrograde rotation but is now classified as a dwarf planet.